Click on any section below to see detail. We also provide a PDF version for printing. Club runs are led by registered leaders who ensure that the rules are adhered to and the ride is safe and well organised. However, it is the responsibility of all riders to assist the leader by adhering to these guidelines. The leader is the official representative of the club and his or her instructions should be obeyed. The ride will be led back to the environs of the starting point. Individual riders disperse at their convenience and the main leader may be substituted if it is inconvenient for him or her to return to this point. Riders must be considerate to all other road users and remain aware of the road traffic situation at all times. They should be aware that large groups of riders may present a frustrating barrier to motorists and should ride considerately enabling road traffic to pass with minimal delay. Conforming to all traffic regulations is a condition of participation in CTC rides. All riders (as practicable) should signal an intention to turn right or left and not leave it to just the leader and/or back marker. Look over your shoulder before starting, stopping or changing position to ensure it is safe to do so. If you need to stop for any reason, call out "stopping" before you slow down. Stop close to the verge. Ride in single file on busy roads and under circumstances where it would otherwise be dangerous for vehicles to pass (defer to the leader's judgement). Never ride more than two abreast, except when passing. If riding alone within a group, ride behind the inner rider of a pair. Keep your distance from the cyclist in front, especially when riding two abreast; you or the person next to you may need to cut in suddenly. Take care on lanes, looking over hedges and listening for approaching traffic. When riding the outside position of the leading pair, hold back on the approach to blind corners: there may be traffic approaching. Take extra care when the call "car front" or "car back" is heard. Change to single file riding when vehicles wish to pass or as advised by the leader or back marker. If there is traffic behind which is unable to overtake, split into smaller groups or pull in to help it pass. For dangerous road surfaces (potholes, gravel etc.) call out as appropriate and point with the left or right hand. For other hazards (for instance, walker, jogger, dog, parked car etc.) call "on the left" or "on the right". If a vehicle is clearly having difficulty overtaking, for instance down a narrow country lane, pull in at a convenient passing place to allow it to overtake. Use cycle lanes where practical and appropriate. Normally, except where otherwise instructed, do not overtake the leader. It is accepted that riders will use their own preferred pace on long uphills. If you do go ahead, do not pass the next junction as the group may be going other than straight ahead. If you do pass the leader and miss the next turn it will be assumed that you have left the ride. Pass the leader's messages down the line so that everyone follows suit. After junctions, each rider, if not last of the group, should check that there is still another rider following, and, if not, either wait at the junction or notify the leader. Members wishing to leave the group should notify the leader to avoid their being treated as 'missing persons'. Cycles must be legal and roadworthy with working front and rear lights at night or in poor visibility. If you fail to comply, the leader may refuse to allow you to join the group. Light or brightly coloured clothing is recommended, with reflective clothing or belts at night. An approved, correctly fitted helmet is also recommended but not mandatory. Members should be courteous to all other road users. You should not rely on other members to have tools. Carry a minimal tool kit adequate to fix common mechanical problems. As a minimum it is suggested you carry spare tube(s), puncture repair kit, pump, tyre levers and allen keys. Always carry your address and a telephone contact number in case of accident. Mudguards do more than keep you dry, they stop spray from affecting other riders - please consider your fellow riders. Club runs continue regardless of weather. 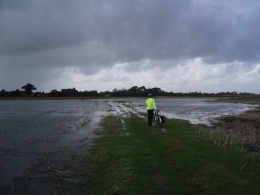 When setting out on a bright, warm, dry day, don't overlook the possible need for lights, warm clothing or waterproofs as it gets later, colder and wetter. Club runs generally stop where refreshment may be bought at appropriate times. However, you are advised to carry water to prevent dehydration and emergency food to remedy or prevent loss of energy on longer rides, particularly in summer. Carrying a mobile phone is useful for emergency use. If you are a new member of the group and are finding it difficult to keep up, do not wait until you are dropping off the back of the group but tell someone riding with you so that you can be assisted. It is your responsibility to make them aware. Leaders must be members of the CTC and registered as a leader. This gives essential organiser's third party liability insurance cover. The club's reputation depends to a large extent on its friendly, capable and competent leaders. Ride leaders have a duty of care to members of the ride and must try to ensure that the rules are adhered to and that the ride is safe and well organised. The leader is the official representative of the club and their instructions should be adhered to. Where possible, choose routes which avoid main roads and potentially dangerous junctions and roundabouts. To avoid unnecessary stops, ensure that you are familiar with the route. Identify points of interest (and coffee stops and toilets) and allow time for riders to appreciate them. Check that the chosen refreshment stops are open and can accommodate the likely numbers. Aim to arrive for lunch as close to the previously set time as possible, and agree a leaving time. Ensure that you have standard ride entry and incident reporting forms with you. Appoint back marker(s) (different riders for separate sections if preferred), Explain to them the route and details of coffee, lunch and tea stops. If there are more than about eight riders, split into two groups. If you deviate from the stated route ensure back markers are made aware and/or wait for the whole group to catch up. Before the start, describe the ride briefly and introduce yourself and the back marker to riders and especially to newcomers. In the case of newcomers, check if they are members of the CTC. If not, ensure that they complete a standard ride entry form and sign the disclaimer. Make sure that you get the completed form to the secretary as soon as possible. Try to ascertain the group-cycling experience of newcomers, tactfully check their cycle for safety and introduce them to a few members who can 'help' them on the ride. Ensure that riders and their bikes do not cause obstruction at the meeting point. Always choose a safe place to stop as a group. In particular, avoid road junctions, bends and other physical road hazards and where possible get off the road. Warn riders before stopping, and keep the carriageway clear. Similarly, in the event of punctures, breakdown etc. clear the carriageway if possible, or instruct the group to continue to a safe waiting place. Assess the problem and decide whether to hold up the ride or leave the 'victim' with helpers and details of the route to the next stop(s). If unsure of the route, stop well before a junction to consult map. Check for presence of back marker at junctions. If necessary wait for slower riders beyond the junction. If necessary, a warning of approaching traffic should be given by shouting "car front". Similarly, the back marker (or last rider) should give warning of traffic from behind by shouting "car back". Give positive instructions to ride in single file when road or traffic conditions dictate. For dangerous road surfaces (potholes, gravel, wet leaves etc.) call as appropriate and point down with the left or right hand. For other hazards (for instance, walker, jogger, dog, parked car etc.) call "on the left" or "on the right" and slow the ride down if appropriate. When traffic is held up behind, give positive instruction to open gaps in the ride (at least 50 metres between groups of about six to eight riders) to help traffic to pass with safety. When you see a road junction warning sign, assess the junction (type, traffic, visibility into junction) and ease the speed of the ride as appropriate. On approach try to establish eye contact with driver(s) waiting at, or approaching junction from a minor road on your left, to encourage them to give way. When approaching horses, warn group and slow the ride down. When closer warn the horse rider verbally of the group's presence (horses are accustomed to human voices). Do not use your bell as this may startle nervous horses. Take account of any advice given by the horse rider. Directional hand signals must be given to the group (and other road users) in good time. (Verbal direction should be given to a rider abreast). Normally lead from the front. When the route deviates from 'ahead' at a junction, instruct a rider to wait for any slower riders. This keeps the group moving. If the ride has spread out due to the pace, slow the ride down. If any form of accident or near miss occurs involving members of the club run, complete a standard incident report form. Check that new riders understand the distance and speed of the ride. It may be appropriate to assign an experienced rider as a ‘buddy’ to accompany a newcomer. The leader should always carry both standard entry and incident reporting forms and ensure their prompt and accurate completion when the need arises, forwarding them to the club secretary as soon as possible.